Potential Gas Industry Role Model Found for Spectra Energy? Spectra Energy, recently cited by the feds for probable pipeline safety violations,1 remains absent from any meaningful conversation with concerned stakeholders in Pennsylvania. Repeated phone calls and e-mails since July 12 receive no response. Gas chromatography test results – Why isn’t Spectra Energy sharing its complete gas chromatography test results of James and Karla Levy’s home and water well (number one on the map)? Are the test methods flawed? Or will the report show that Spectra Energy is producing gas from its storage wells? Discharge of Industrial Waste – Spectra Energy’s SR 10 well, near the Levy property, was cited by the Pennsylvania Department of Environmental Protection (DEP) for a discharge of industrial waste onto the ground which subsequently polluted nearby water – probably Schaffer Creek. This was two months after the well went into production, according to DEP and Federal Energy Regulatory Commission (FERC) records. Drilling mistake – At Spectra Energy’s SR 11 injection/withdrawal well, the company drilled nearly 200 feet outside its permitted area into another formation and plugged the hole with cement to prevent gas migration, according to DEP records. In fact, according to the Levys, Spectra Energy representatives promised them several times to provide copies of the test results; but they did not make good on that promise. “I guess we were insanely naive to think they could possibly be ‘good neighbors’ since we are certain that there is still significant methane in our well,” says Karla Levy. If there is no problem, what’s the problem with sharing test results? Why won’t Spectra Energy representatives keep their promise to landowners? Unless the test results raise more questions. For example, in addition to looking at test methods which may or may not be designed to produce non-matching samples,4 would its test results show that Spectra Energy is producing gas from its storage wells? Storing Gas or Producing It? But why would Spectra Energy care if the public knew the injection/withdrawal wells were also producing native gas? They can do this legally – even as they legally seized surface and subsurface property rights under the threat of eminent domain. The power of eminent domain was granted to Spectra Energy by FERC. And the Marcellus Shale “gold rush” will see more use of eminent domain in all of its forms as gas companies continue the land rush in Pennsylvania, New York and other states. 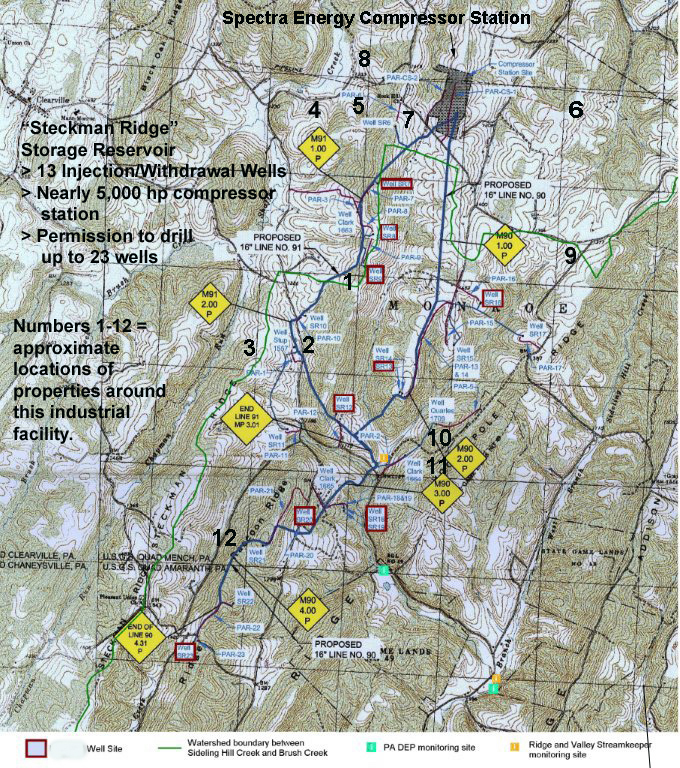 But it is not well known that FERC permits storage field operators like Spectra Energy to seek and to capture migrating gas — including “native” or new gas (not to be confused with “storage” gas). Drilling Error – Gas Migration? Spectra Energy’s SR 11 injection/withdrawal well went into service in April 2009. Apparently in March, it drilled through the Oriskany formation into the formation below it. The risk is that gas will migrate into other formations as Spectra Energy admitted in reports it is required to file with FERC. SR 11 is located on Glynn Needham’s property. (Her property is not currently identified on the map but it is roughly between number 3 and 12 on the map. One can see “Well SR 11” next to the yellow diamond shape.) The company drilled through the Oriskany formation into the formation below it, according to DEP well completion reports and Spectra Energy’s biweekly report (submitted April 3, 2009). Property owners surrounding Spectra Energy’s heavy industrial complex at Steckman Ridge seek answers to legitimate questions. They are not ‘picking on’ the nearly $5 billion dollar Spectra Energy. They are worried about a continuing pattern of health, water and operational concerns. It is not corporate citizenship to refuse to respond to neighbors’ issues. It is not corporate citizenship to promise to share gas chromatography test results then renege on that promise. And despite corporate platitudes about safety, Spectra Energy does not have a best-in-class track record that might build confidence among neighbors. Clearville residents know, for example, that a mere three years before Spectra Energy applied to FERC for permission to construct Steckman Ridge, an inferno exploded at another of its underground storage reservoirs outside of Houston called Moss Bluff. According to public accounts, there were two explosions, a fire that burned for six-and one-half days sending flames as high as 1,000 feet, as 6 billion cubic feet of natural gas burned off in an uncontrolled release. Fortunately, there were no fatalities; but there were two separate evacuations — 30 families in a one-mile radius followed by an evacuation of 100 people from a three-mile radius. Steckman Ridge is about 3 miles from an elementary school. Let’s end on a constructive note and offer Spectra Energy executives and directors a possible role model example from their own industry. The Canadian connection might be helpful since Spectra Energy CEO Greg Ebel is a native of Canada. Wouldn’t it be great if they speak the same language in terms of safety, integrity, transparency and accountability. NOTE: This article is cross-posted on the Accountability Central website at this link: http://www.accountability-central.com/nc/single-view-default/article/voices-from-the-shale-day-27-and-counting-no-spectra-energy-response-to-stakeholders/ Accountability Central is part of the Governance & Accountability Institute, Inc.